I am loving the latest addition to the Hallmark Rewards program. 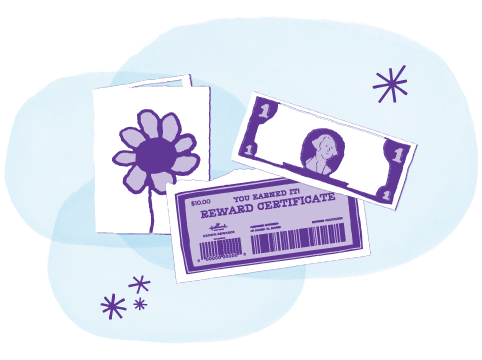 This is an addition to the Crown Rewards card you use in Hallmark stores- now you earn rewards for Hallmark cards you buy other places including CVS, Walmart and grocery stores. It’s simple to use- either type in the code on the back of the card on their website or use the smartphone app and scan it. For every 5 cards you enter, you earn one reward. 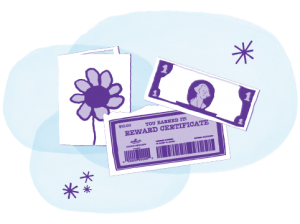 A reward can be redeemed each month for $5 (or sometimes $10) gift certificates or entries into sweepstakes. Last month, I redeemed my points for a $5 Lowe’s gift certificate and this month for a $5 Starbucks gift certificate. If you buy Hallmark cards (and who doesn’t? they are everywhere), you might as well use their rewards program to earn freebies for your purchases!